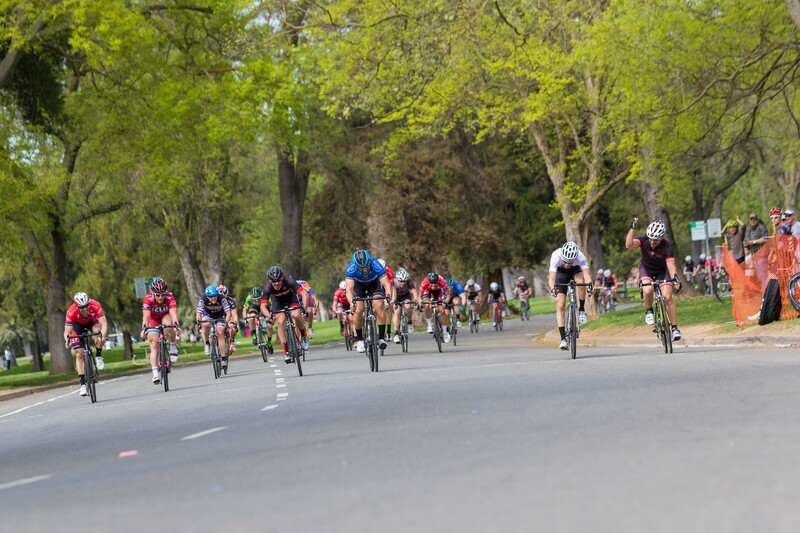 The Master’s field, as always around NorCal, was stacked with former National Champions and former pro racers all still fit and more competitve than most men their age. Specialized Team had the numbers and most of the day they were active getting into the break or chasing it down. About midway through the 50 minute contest a group got away after a prime lap with Mike Sayers, Michael Buckley, Curt Mills and a few others I can’t recall. The break had a good gap on the field, but with Folsom Bike’s team leader not making the select group, they hit the front to bring it back for their big gun, John Novikoff. With five laps to go and the break getting caught, Sayers and two Team Specialized guys attacked and kept the move going. In the next 4 laps, Folsom Bikes and a mix of other teams helped to keep the pace high with the hopes of catching the leading trio before the finish. Folsom Bikes continued their relentless pace setting but on the last lap they ran out of men to lead John and he found himself on the front going into the round-a-bout, catching the break at the same time. The round-a-bout is approximately 800 meters to the finish (maybe more). I had John’s wheel as he hit the gas full-on indicating his intention to take the round-a-bout and the last corner from the front hoping to still have enough for long sprint finish. We came around the last corner and John hit the sprint hard into the headwind finish and I was able to use the wind to my advantage by sprinting on his wheel in his draft ready to accelerate closer to 150 meters to the line. Remembering his last effort here at Land Park (Cal Aggie Crit), John made a move to the left (shorter route) gutter causing some distraction in the sprint. As the gutter opened up nearer the line I came around his left, only to be blown past myself by former criterium National Champion Dean LeBerge. While the win by Dean was impressive and honestly, to be expected, John’s leadout and eventual 3rd place finish was quite the display of strength. Look at those guns he’s sporting. Criterium racing is fun and as shown by the result, you can benefit from great team work or you can capitalize off others. My teammate Curt Mills is always looking out for me during races and does the little things giving me a chance against the bigger teams. The Pro-1/2 Race report is best left for those that were near the top step of the podium. Travis Lyons of Team Mikes Bikes captured some quality video of the race from his bike. Herbalife p/b MarcPro-Strava took the Bang-Bang to a new level by winning Wards Ferry RR (Justin Rossi) ealier in the day, then coming to Land Park and winning in the sprint (Josh Carling). Impressive wins by the green clad NorCal boys. With a good result in the Master’s crit, we were well placed for the Omnium overall if we managed a good result for me in the 70 mile Bariani Road race the following day. I had a bad spot of energy on lap 2 of 5 and missed the crucial breakaway of around 6-7 riders including two Team Specialized teammates (who lined up 10 guys in our race), a Mike’s Bikes rider and Chrono’s stalwart Kevin Metcalfe – all with significant team members back in the field to police the chase attempts. Oddly, Mike Sayers of HSP was the only rider in the break with a top 5 result from the criterium and therefore the other teams were virtually gifting him the Omnium overall in their search for the road race win in exchange. We never caught the break, but with a few guys getting dropped out of the lead group there was still a chance of doing well overall with a good field finish. With this in mind, my teammate Chris Flower guided me to the front before we turned into a nasty cross wind about 7 miles from the finish. As we turned East with a cross wind, Curt Mills took over getting me straight to the front and continued to ride hard tempo for roughly 3-4 four miles not caring about hapless attempts by a few to make a last ditch effort to break away. The point here was to keep me at the front for when the inevitable lead-out trains began for the other sprinters hoping I could join the party with a free ride. The finish is a long drag uphill and directly into the wind. I had a tough time getting on a wheel to shield me from the wind and ended up eating more energy than necessary to maintain my position near the front. With 300 meters to the finish I was on John Novikoff’s wheel with the hopes of repeating the my criterium result when he started his move. But I had nothing left in my legs to follow his eventual 2nd place in the field sprint. Mike Sayers was 3rd from the break giving him the Omnium overall and John 2nd. I left without looking at the remaining results knowing my 21st on the day wasn’t enough to get me in the Omnium top step. As always, my teammates and friends helped make the day a good time even without the result we were hoping for. It’s especially disappointing to have teammates ride their hearts out for you and then let them down in the finish. But such is bike racing. I want to thank the sponsors we have helping to make results like this possible – Data Driven Athlete, Kinetic Cycles, Barrell & Janke Law, Race Rims Wheels, Specialized, Skratch Labs and Device Brewery. They help us out for the love of cycling, give them a visit. This entry was posted in Race Reports, Tyler Janke.